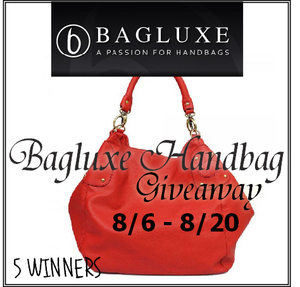 Bagluxe, a specialty online retailer of fashion-forward chic, affordable handbags, purses and accessories (influenced by the latest runway and celebrity trends) knows that every girl has a passion. Well, Bagluxe has a passion too… it’s handbags, of course! Their website features a wide range selection of fashion handbags and related accessories — all priced at under $85.00. The company aims to build a trusting relationship with women who love handbags by ensuring superior customer service and offering quality, inexpensive products that are always on-trend. I love bags of all kinds and have a big bin full of them. I use them daily, and love to change them out. My problem is I can never seem to carry everything I need with me. Bagluxe bags are much nicer than my traditional purchases, and I would love to have a beautiful bag for work or anywhere I need to make an impression. These bags are exciting and fun, and I love that. To enter, please use the rafflecopter form below. And don’t forget to come back daily to gain additional entries. The more entries you have, the better your odds of winning.